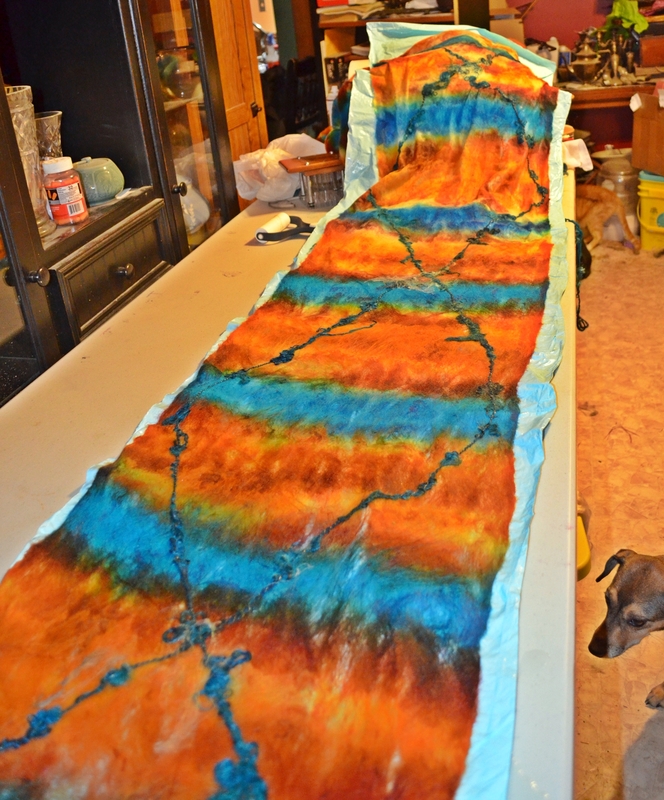 Continuing from Part Two of cobweb felting, I continue wetting and rolling up the wool roving in the plastic until the end. Then I put a couple of rubber bands on each end. Put the roll into a lingerie bag. 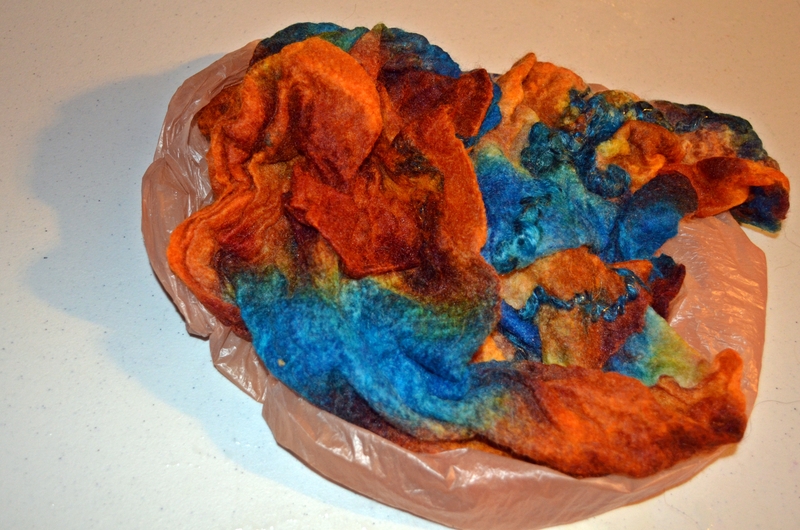 And then put it in your dryer for 20 minutes – no heat – then take it out and unroll. 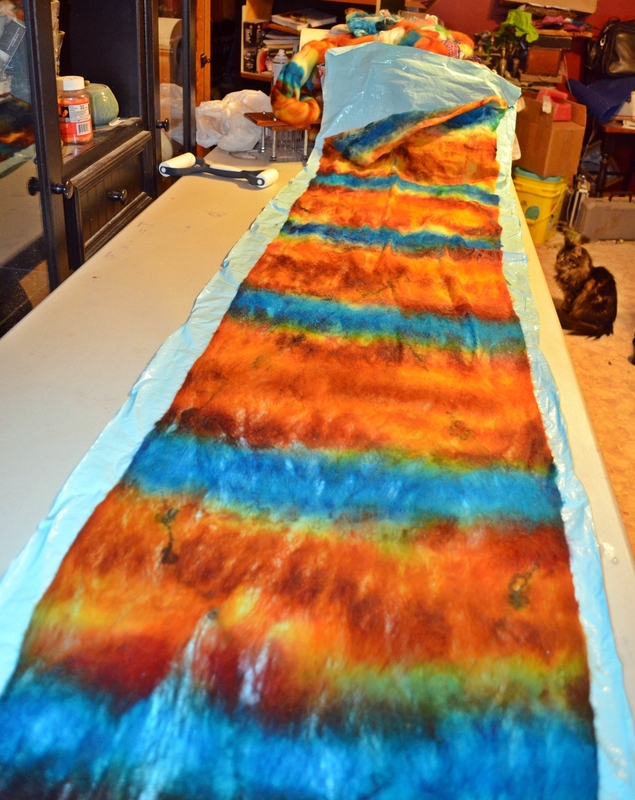 Next, you are going to roll it up again, only starting from the opposite end – make sure the wool is still wet, if not, spray with more water. It does need to be nice and wet. Put it back in the dryer, no heat, for another 20 minutes. 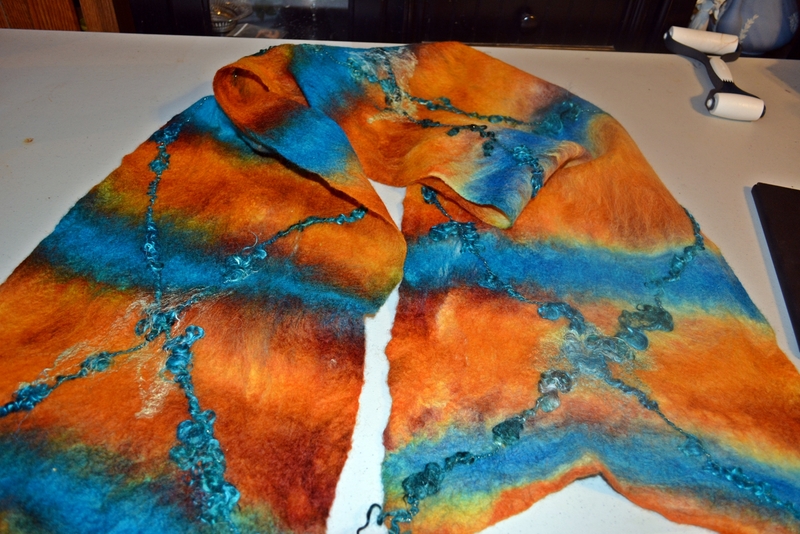 When you take it out and unroll it this time, you are going to flip the whole thing over – by now, it will be felted enough that you don’t have to worry about it pulling apart at all. Once again, roll up in the plastic, making sure the wool is nice and wet, and put it in the dryer for another 20 minutes, no heat! Then take out the rolled wool, unroll once more, reroll in the other direction and back in the dryer for 20 minutes. Now, for the final step. Unroll the scarf and get it wet and wring it out and make it all scrunched up. Yeah, scrunch it up good! 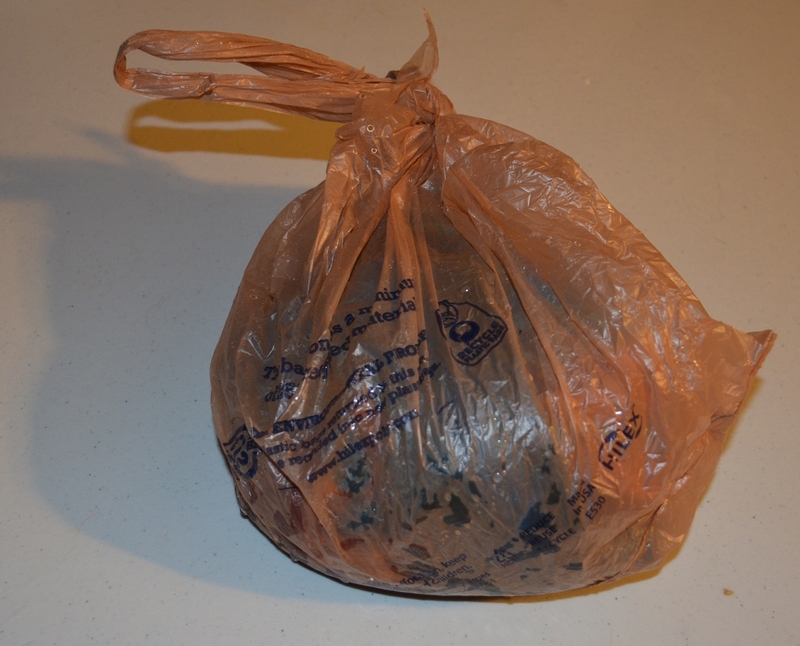 Finally, put it in a plastic grocery bag and put it back in the dryer for 5 minutes. When you take it out of the dryer, it should be fulled quite well. Don’t leave it in much longer or it will get too thick and not be as soft and pretty. Take it out of the bag and unscrunch it – you can pull and tug it to shape it the way you want it. I usually just hang it over a shower curtain to dry, but you can block it like you would a sweater, or you can even use an iron with an ironing cloth to speed the drying and to make it flatter. And here is the final product – at this point, you can embellish it with needlefelting, or just leave it as is. I think my handspun mohair lock yarn is enough, so I’ll stop here. 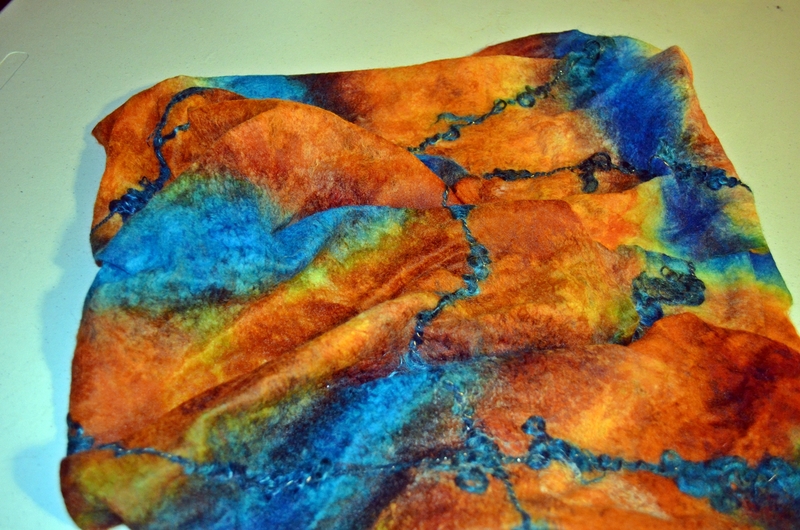 This entry was posted in Cobweb Felted Wool Scarf, Tutorial and tagged cobweb, scarf, tutorial, Wet-felting. Bookmark the permalink.